Casual Friday – What’s New? Product Review and Giveaway: Go Go Pets! My girls, Rachie (4) and Alli Cat (3), were so excited when I opened the box sent to us by Maria Bailey at Mom Select. Inside were all the parts needed to create a hamster wonderland. Real hamsters? No… Go Go Pets! All the fun of hamsters with no mess! At first I was a bit overwhelmed with the task that lay before me in assembling our test toys. But as each section was assembled, the girls were getting more and more excited to try it out. By the time I finished… I was excited too! The Go Go Pets Hamsters make the cutest sounds as they scuttle around their home of tubes and slides and wheels. Their sounds seem to correspond with the area of the house that they are in. For instance, in the bedroom area the Go Go Pet seems to pause on the bed and then an alarm clock rings. It makes my girls giggle and scream “wake up”! I admit… I was having fun watching the Go Go Pet do his tricks. It moves around the house unassisted and plays with the various toy attachments. My favorite to watch is the hamster wheel. It climbs in and runs around and around before coming to a stop and climbing off all by itself! 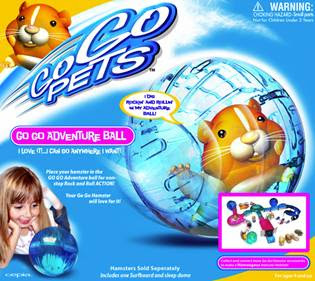 I found that using the Go Go Pets on a hard surface, such as my kitchen floor worked best for when the hamsters came down the slide or took a drive in their cars. The set will work on level carpet too, but you may have some issues with the Go Go Pet rolling properly if you have an attachment that allows your pet to escape, such as the car. All in all.. we love our Go Go Pets. My girls have played with it daily and we’ve had it over a week now. It’s just like watching a real hamster, but there’s no feeding or cleaning up! 1. You must do this: Tell me a messy pet story you’ve experienced! 2. Visit the “shop” at www.childhoodclothing.com and tell me what your favorite piece is. 4. Follow @childhood on Twitter. 5. Tweet about this contest… include @childhood so I can read! 6. Blog about this contest on your site and link back to this post. I’ll be using Random.org to choose the winner. The contest ends Wed. June 3rd, midnight PST. I will post the winner when I wake up :) Thursday, June 4th. Good Luck! My FIRST Vlog Ever: Cutting Down on Waste! My First Vlog! from Kelly Loubet on Vimeo. I’m not sure about you… but when I bring up friends I’ve met online in a conversation offline… I get some strange looks. This morning I was visiting http://www.jenhinton.com/ … better known to most as @keepitclassyjen. She had a vlog post about how a simple “hello” turned into a growing circle of friends. Not only that… but these friends are not just e-friends, but real life friends. I couldn’t agree with her more. The friends I’ve made so far in my short time blogging and tweeting, have been such a support to me. In the past 3 months, I’ve closed my boutique, my husband lost his job, I’ve had marriage problems, and the list could go on… but the few close friends I’ve met have helped me through it. My first business, mom, and friend contact was Leah Segedie of www.bookieboo.com . I joined Bookieboo because I was getting back into my sports and fitness. Then I decided to advertise with her. She started buying from my boutique. I started writing and contributing. She started asking me to moderate the site and parties with her. Then all of a sudden… I had a new friend. She has been not only a listening ear, but she’s full of ideas, she’s an unbiased opinion, and she’s generous too. Since then… I’ve met so many wonderful, generous, helpful people… Maria Bailey @momtalkradio, Lynne Kenney @thefamilycoach, Ilana @lanaclevermomme… I’ve come to love these great tweets who make fun converstions @banteringblonde, @keepitclassyjen, @sugarjones, @ginalaguardia… People who respond to my blog posts @bluefroggie @mommymomo I could go on and on… please don’t feel left out if you read this and I didn’t include you. A couple of weeks ago, I received a package of women’s Sporty Socks in the mail from Little Miss Matched to review. If you aren’t familiar with Little Miss Matched, the socks don’t come in pairs… they come in threes. This is what makes them so unique. 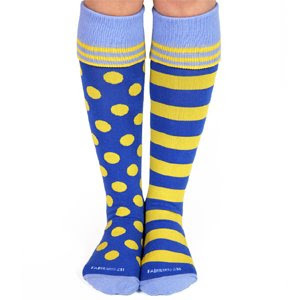 The Sporty Socks I was trying out, were blue and yellow. This was especially nostalgic to me because I was a major athlete in high school and our team colors were blue and yellow.. Go Eagles! I had my choice of stripes, dots, and stars to wear around. I went with dots and stripes. If you haven’t seen the website, check it out! It’s not just socks! Little Miss Matched does indeed have socks for men, women, boys, girls and baby… but they also have flip flops for this summer! They have camisoles and undies and even furniture! Follow @littlemissmatch on Twitter for great contests and prizes too!